Breaking News: up to sixteen upgrades to England’s busiest roads including the Stonehenge tunnel “could be scrapped”! Whitehall’s spending watchdog has suggested that sixteen upgrades to England’s busiest roads could be scrapped because they do not represent value for money. See details here. Great news for Stonehenge World Heritage Site, so long as value for money is given its proper meaning……. Is it value for moneyto spend £1.3 billion of taxpayer’s money on a tunnel that would cause almost incalculable damage to a World Heritage site? Is it value for moneyto spend £1.3 billion of taxpayer’s money to remove the public’s favourite free view of Stonehenge? Is it value for moneyto spend £1.3 billion of taxpayer’s money on a road scheme that doesn’t include spending a single penny on direct traffic calming in the local villages? Is it value for moneyto spend £1.3 billion of taxpayer’s money to grant the National Trust’s wish for a theme park walk? Were there ever any sacrifices at Stonehenge? 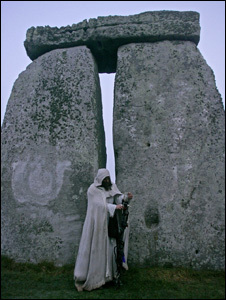 The mythology of Stonehenge is deeply tied to the Druids. This is because some historians in the 17th century felt that the monument represented a temple and that it had been built by a pre-Roman society. As the only pre-Roman society that they knew of was the Ancient Britons and because the Romans had spoken of a priesthood called the Druids, it was obvious to them that Stonehenge was a Druid Temple. This turned out to be the wrong conclusion, but the idea stuck. One thing that everyone thinks they know about Druids is that they performed human sacrifice – that information comes to us from Julius Caesar in his accounts of the Gallic Wars of 58BC to 50BC, but he may have been exaggerating the ferocity of the Gaulish tribes to increase the prestige of his victories. The famous imagery of a Wicker Man stuffed with prisoners and set alight comes from these writings. Certainly the Druids were a problem for the Romans, being the closest thing to a central authority held in respect by the many tribes and with the notable ability to raise opposition to the invading armies. Other classical writers wrote that the Vates (part of the priestly class) used to slice open the guts of a victim and read auguries of the future from the twitching entrails on the ground, while a Druid presided over the ceremony. By the 19th century one recumbent stone at Stonehenge had acquired the name “The Slaughtering Stone” because the hollows on its upper surface fill with rainwater that turns red – supposedly from the blood of the victims sacrificed upon it, but in fact due to iron in the stone and particular algae on it. As with so many other myths, this bloodthirsty idea has stuck. So far so gruesome, but when it comes to Stonehenge is there actually any evidence of sacrifice being carried out there? We have records of four bodies having been found within the area enclosed by the henge bank and ditch earthwork. Of these burials, two are missing entirely: the one found in the centre of the stone circle is long lost and the whereabouts of the partial burial from the henge ditch on the eastern side is also unknown (the excavator believed it not to be ancient). The other two are more interesting – one was found close by the southeastern side of the monument just outside the stone circle in 1923 and the other was found in the ditch to the west of the main entrance in 1978. The southeasterly burial was that of a man who had been decapitated from behind with a sharp bladed instrument, probably a sword – the evidence is in the cut marks through his 4th cervical vertebra and below his jaw – and then unceremoniously stuffed into a grave hole not quite big enough for the body. This is certainly an execution but it dates to between 600AD and 690AD, the Anglo-Saxon period. The final burial is very interesting. When discovered, the body was in a neatly prepared grave (rather than a hurriedly scraped hole) and accompanied by what appeared to be grave goods – a stone “bracer” or wrist guard to prevent his bow-string hitting his wrist, and several flint arrowheads. The young man buried in the grave was dubbed “The Stonehenge Archer”. On closer inspection it became clear that the tips of these arrowheads were embedded in the bones of the body, so he was the Stonehenge ArchEE, not the ArchER. He had been shot in the back, at least three times from different directions, and the coup de grace had been delivered when he was face down on the ground – the final arrow pierced his body and ended up in the back of his breastbone. The victim was killed between 2400BC – 2140BC. Does the care taken in preparing his grave, coupled with the prestigious position of it next to the entrance, mean that he was a ceremonial sacrifice? For now, this remains the only clear evidence of a violent death at Stonehenge during the time when the monument was almost certainly in active use. The Stonehenge Archer’s remains are now on display at Salisbury Museum.